ISLAMABAD: Senate Standing Committee on Planning, Development and Reforms was informed here on Friday that the water mafia in Gwadar city was very active and was supplying 2 million gallons of water to the city daily which costs the consumers over Rs 800 million. “At present, total demand of water in the city is around 6.5 million gallons per day, however, it is being supplied only two million gallons of water per day and the tankers fetch water from far off Mirani Dam, therefore one tanker costs over Rs15000 to the consumers,” Balochistan Planning and Development (P&D) Secretary, Muhammad Ali Kakar informed the committee. He said that construction work of the nearby Aakra Dam was ready which was designed to provide 2.5 million gallons of water daily but there was no water in the dam due to fewer rains during the previous four years. Senator Talha Mehmood said that massive construction in the city under CPEC was on the cards and hundreds of thousands of people would start living there but it can’t be managed without any clean drinking water facility. He said that this issue could easily be resolved by restoring the water desalination water treatment plant. Muhammad Ali Kakar informed that an amount of Rs 400 million was required to refurbish the water treatment plant for which the Balochistan government had already committed and work on this plant would be started soon. P&D Ministry Federal Secretary, Shoaib Ahmed Siddiqui suggested that the committee call Balochistan chief secretary, chairman Gawadar Port, and Gawadar Development Authority director general in the meeting to discuss the issue as a debate on this issue would be useless without their participation. Committee Chairman Senator Col (R) Syed Tahir Hussain Mashhadi said that no proper attention was being given on provision of clean drinking water to the city as per demand. He expressed his displeasure over the non-attendance of Balochistan’s chief secretary saying that by not informing of his non-attendance in the meeting, he has violated the constitution besides hurting the sanctity, honour and dignity of the Senate of Pakistan. 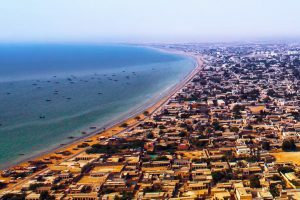 He directed to form a sub-committee to find out the solution to Gawadar city’s acute water shortage, enforce the implementation of already existing projects and provision of fresh water treatment facilities, water supply and distribution in Gawadar under the China Pakistan Economic Corridor (CPEC). Shoaib Ahmed Siddiqui said the issue was also being presented to the PM in the Cabinet Committee on CPEC, who also directed to work on a fast track solution. He further said that the ministry of planning had given two solutions to the government of Balochistan and if the provincial government works with commitment, this issue can be resolved within one year. Moreover, he also suggested to hand over the water desalination plant project to -a Chinese or Pakistani- private firm to ensure efficient running of the project. Meanwhile, briefing the committee on the CPEC’s long-term plan, Shoaib Siddiqui said that there were seven pillars of cooperation between the two countries including infrastructure, energy, tourism, agriculture and poverty alleviation, social connectivity, financial cooperation, and trade and industrial Parks in the LTP of CPEC. Regarding financial cooperation, the secretary said that negotiations were going on for the currency swap agreement, however, at present, the two governments had not yet been reached to an agreement in this regard. He said the government was committed to making all decision under CPEC in the larger interest of the country. Briefing the committee, CPEC Ministry of Planning Media Director, Shaukat Khattak said that currently, more than 20,000 Pakistanis were receiving education in various universities of China which is the largest number of foreign students in China. He said NAVTEC had arranged Chinese language courses across Pakistan to give Mandarin training to Pakistanis.